Marcio, living in Canada, of Japanese extraction but born and brought up in Brazil refuses to be called a chef. “I am not a master yet”. Marcio gave up his job as a financial analyst in Sao Paolo, Brazil to pursue his passion and his dream – to become a professional chef, with a view to opening his own restaurant a few years down the road. He carried out his professional training at the renowned George Brown College in Canada and spent two years working for a well-known Italian/Tuscan restaurant in Toronto. 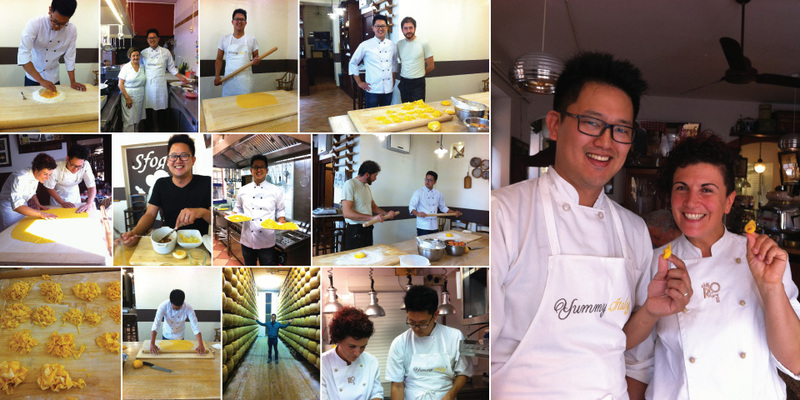 Marcio came to us looking for a full-immersion into the world of pasta-making and the products of Emilia Romagna. We put together a week long programme for him, concentrating on 3 full days of making pasta by hand, each day with a different tutor, in order for him to acquire all the skills needed and then develop the method that suited him best. We organised workshops with a professional pasta-making laboratory, a professional chef and our ‘sfogline’ or ‘nonna pasta makers’, so that he could completely refine his skills when he went back home. As well as mastering the art of tasting several renowned PDO and PGI products, he also saw how some of the region’s most famous foods are produced. Yummy Italy selected several restaurants for Marcio to eat at – predominantly those which best represented the foods that he had learnt about. We also organised some ‘mini’ internships for Marcio in two award-winning restaurants – one Michelin star restaurant best known for its early adherence to the Slow Food movement, its ‘innovative’ fidelity to the traditional cuisine of the area and truffles, and another more traditional, family-run restaurant of excellent quality. Even though it wasn’t part of the ‘agreed’ program, we also wanted Marcio to get a basic idea of the wines of the area so that he could understand the food pairings often made locally with the typical cuisine. So we dragged him to a local, award-winning vineyard… and then had terrible problems in dragging him away. Finally, we introduced Marcio to a supplier of pasta-equipment which we visited together and where he selected several items that would help him with his pasta-making back in Canada. Marcio says: “ I spent a week in Emilia Romagna and my goal was to learn how to make and understand more about authentic regional pasta and other products. Yummy Italy turned my expectations of an in-depth learning experience into an amazing experience. Thank you so much for making everything possible. The taste of the gnocchi dough is still in my head”.